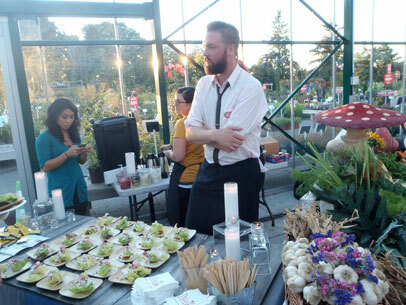 This year’s Incredible Feast lived up to its name, as more than 25 chefs paired up with superstar farmers, ranchers and cheese makers on Sunday at Swanson’s Nursery. Chef Tamara Murphy dreamed this dealie-o up years ago as a way to showcase the incredible edibles that show up at the Seattle Neighborhood Farmers Markets. Man, we are lucky to live here! There sure were some gorgeous examples of veggie prowess on display and for consumption: Charles Walpole from Blind Pig Bistro made a beautiful panzanella with a charred eggplant sauce on the side; Palace Kitchen’s Dezi Bonow dressed pretty greens in a buttermilk dressing and put some smoky pickled red onions on top; Philippe Thomelin of the lovely Olivar stuffed a spicy vegetable mix into empanadillas and fried ‘em on site. Yes, there’s nothing quite like a crispy veggie pie. Allium’s Lisa Nakamura brought her B game, and by B, we mean beautiful black beans, which sat on top of succulent slices of last-of-the-season tomatoes. Pork was also given star treatment by these uber-talented chefs. Zephyr Paquette from Skelly and the Bean wrapped Olsen Farms pork belly around Olsen Farms tater tots, while Crush chef Jason Wilson let Skagit River Ranch pork belly shine like the meaty gem it is. Steelhead Diner’s Anthony Polizzi made a pretty terrific pork terrine while Matt’s in the Market’s Chet Gerl created a fiery sausage. Dustin Calery of La Boucherie braised some shoulder until it was as tender as… well, beautiful braised pork shoulder. Seth Caswell made a dynamite pot pie from Alm Hill rabbit, Terra Plata’s big cheese, chef Murphy, reminded everyone of how much they loved big, fat mussels and Matt Lewis straddled the fine line between sweet and savory with a beignet wearing a crown of sage-infused butternut squash. You know what went well with all this Incredible Feasting? Whatever The Pike was pouring. Always great to see local food boosters Charles and Rose Ann Finkel at these kind of events. On the sweet side, Cle Franklin of Half Pint Homemade Ice Cream made a stunning sorbet with Rockridge Orchards apple cider, while long lines formed to sip something that can only be described as a straight shot of Autumn. And by Autumn, we mean Autumn Martin from Hot Cakes Molten Chocolate Cakery, who was pouring sippy size portions of Butterbeer. Yes, just like Harry Potter drank. It tasted a little like caramel tea with a champagne float on top. She’s going to soon be serving it at her Ballard shop, and you really need to go taste it. Beyond the fantastic food and fine company, there was another feel-good take-away from this event. The money raised benefits the Neighborhood Farmers Market Alliance’s Good Farmer Fund (which provides emergency relief for local farms) and community programs, including the food stamp bonus and food education. Save the date for next October!